I'm trying to do an IDW interpolation with QGIS tool. But i'm really surprised by results. Interpolation values aren't similar as shape values. I used a power of 0.2 to get a smooth raster. Somebody have an idea ? If I understand correctly, The histogram shows correct range of the data. But you have selected cumulative count cut in style manager, that's why by default min 2% and max 2% have been truncated from the range. Choose the min/max option to see the whole range in the legend as well as map. Not the answer you're looking for? Browse other questions tagged qgis raster shapefile interpolation inverse-distance-weighted or ask your own question. 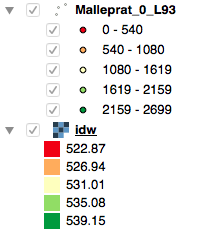 Performing IDW interpolation in QGIS?